There are several things to consider when planning to build a pool house cabana, but with an eye for detail and careful planning, you can have everything you dreamed of and more. The first question to consider is “what do I intend to use my pool cabana for”? To some extent the answer to this question will impact all others. We suggest you make a list of all the functions you would like your Pool House to serve, as part of the planning process. If you are installing a new pool, be sure to involve your pool company in the decision making process; they will have some good suggestions and certainly the experience to know what’s important for your structure. Also thinking about a storage shed for your other backyard needs? See our detailed guide on how to choose one first. There aren’t too many choices here; generally you will locate your pool house cabana within striking distance of your pool. There are some things to consider though: how to maximize sunlight; do I want the cabana to be front and center or blend into the landscape a little; do I need to run electricity and, do I need to plumb it for a bar sink, toilet, or outdoor shower. Evaluate the pros and cons of your preferred site in all four seasons. The surrounding foliage (and weather) can be very different from one season to the next. All of these considerations may have some impact on where you decide to build your pool house. Once you have decided on a site, choose a cabana size that’ll suit your needs (see ‘choosing a size’ below). It’s a good idea to stake out your pool house to ensure that the fit is comfortable for your needs and that the location is harmonious with your landscape. Decisions made on the size, location, and style of your pool house cabana are not entirely in your hands. Be sure to check with your municipality to ensure that you are meeting the local zoning and permit requirements. If you are under 100 sq. ft. you will not likely require a permit; however, there are usually some restrictions such as a two or three foot set back from a property line to contend with (please see zoning and permits for more information). In some regions there may even be specific regulations pertaining to the construction of structures near a pool. Always check first with your local municipality before building! Typically, pool houses are built on concrete pad foundations. Often customers are pouring concrete for their pool, so it’s very economical to pour an additional pad at the same time. It’s not usually necessary to pour a pad though; patio stones or a crushed stone base work just fine. Regardless of your choice, be sure that the grade is level and that it has good drainage. Our range of poo l house styles, sizes, and options will allow you to design your cabana for functionality without having to compromise on style. Be sure to spend sufficient time browsing in our pool cabana photo gallery and benefit from all the designs that others have come up over the years. Choose a pool house style that reflects your personal taste and fits in to the landscape. Don’t worry about matching your cabana to your house, not every thing needs to match…and why not be a little eclectic! You can customize your pool house to your heart’s content, implementing your personal flair along the way. Most of our styles are differentiated primarily by roof lines (i.e. gable, hip, salt box) so this is an important consideration. It’s also important from the beginning to think about the interior design of your pool house. Partitions often work well to divide space for the various different uses (although the ‘open’ concept has its appeal as well). Benches, shelving, and hooks are very handy and if you are considering one of our beautiful bifold bar windows, extra overhang and height are necessary to ensure that the design balance is correct and that water doesn’t drip off your roof onto the serving bar. Whatever your requirements, we have oodles of options to choose from so you shouldn’t have much trouble achieving a good fit to your tastes and needs. Please don’t hesitate to contact one of our design experts who will be more than happy to help guide you through the process. If you are ready to get started, begin with the main pool house styles. Then if you can’t find it there, visit our photo gallery or head over to our Custom Design Center.We also have a team of design experts that can come up with a virtual drawing of your ideas. Give us a call and we’ll get it to you in no time! It’s smart to think about how you may want to cultivate the landscape in the immediate surroundings. Shrubs, flowers, and trellises draped with vines can complement your Pool Cabana design and will help to define the space. If you have pool equipment, it’s also a nice way to make it less conspicuous. Many people also choose to lay flagstone or other pavers to create a pathway to the door. A little decor always provides a nice touch. Strategically placed, things like trellises, life preservers, cupolas, lights, wind chimes, weather vanes, birdhouses – and even your favorite piece of weathered furniture can go along way to creating the style you are after. This is always a bit of a tough one, but there is no wrong choice, so don’t fret. The average size for a pool cabana is somewhere between 8′ x 12′ and 10′ x 14′ (or the 10′ or 11′ five sided design) but, there are no rules. Clearly the key is to ensure that your space is large enough for its intended purposes, while remaining proportional to the setting. A changing area, pool equipment and accessory storage, mini kitchen, bar serving area, shower and/or toilet – think of the activities that you have in mind to take place in your pool cabana, and plan the space out accordingly. If you intend to share your space with items currently residing in your yard, make sure to allow for enough room for both your pool needs and your stored items (mind you if it’s only ‘off season’ storage you need not worry). Dual-purpose pool cabanas don’t have to be big, providing you assign different uses to different spaces and incorporate some thoughtful and inventive design. Once you’ve decided on a size for your pool house, place some stakes in the ground and outline the sides of your proposed cabana with a string or garden hose. Adjust the stakes until you’re happy with the size and record the dimensions. Note that if you have chosen an inward opening ‘D’ series door, you will need to have four feet of clearance inside your pool cabana. Again, please feel free to contact us at any point in the planning process and we will provide you with as much help as you need. Most of our products are constructed from a premium grade of western red cedar or Canexel maintenance free wood fiber siding (available in many vibrant colors). We only use the finest materials on the market, so be assured that what you get is truly top of the line – we don’t mess around. Different materials create different looks so you may want to consider that if you want your design to extend or complement the architectural style of your house and other structures on your property. Click for detailed information on our materials and siding. There are a variety of options when it comes to roofing materials and here you will have to make an important decision. Obviously asphalt shingles are the most economical and are readily available in a variety of colors at your local building supply store. available as an option. They are truly beautiful and will last a lifetime. Corrugated metal roofing is another possibility. Available in many colors, this is an attractive option and is very adept at keeping the snow off your roof (if you live in colder climates). Another popular choice is clay roofing tiles. Many homes use this tile and it’s nice to have the two structures share this similarity. Just be sure to mention this to our design team, as clay tiles add extra weight and the structure needs to be beefed up a little to accommodate these tiles. Building your Pool Cabana on your own, or Hire a Contractor? Decide on whether you’re going to take on the project of building your pool cabana yourself or if you’re going to hire someone to do it for you. Most of our customers tackle the project themselves and quite enjoy it; a form of therapy or family bonding if you will. Often the neighbors will wonder over and offer assistance as well. 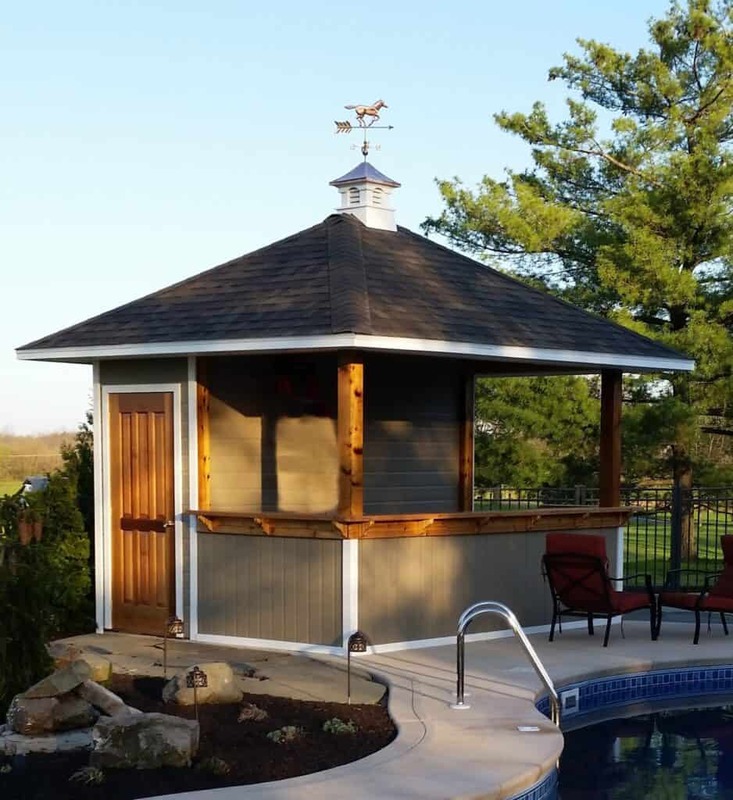 We offer two types of pool house kits, pre-cut and pre-assembled. The pre-assembled goes together much faster, so if you’re building your pool house yourself you may want to choose this option. If you are an accomplished ‘do-it yourselfer’, or ready to make your debut, make sure that you have both the time and the energy required for the task at hand. If not, be sure to have a look at our how to hire a contractor information. When it comes down to which style suits you best, it’s all about your own personal tastes and the application requirements for your pool house. Remember, all of our buildings can be customized to your own personal requirements. Since they’re made to order, we have just the right style to suit you. Palmerston Pool Cabanas – The lines of our Palmerston style pool cabana make it at home in almost any poolside setting. The look is clean and the space is functional, ideal for equipment storage and changing space. Dress it up with a dormer, an assortment of windows, and one of our deluxe series of doors. Surfside Pool Cabanas - Take entertaining poolside to a new level with our outstanding Surfside pool cabana design. Outfitted with a built in bar, this pool cabana is sure to be the center of all the action this summer! Install plumbing for a kitchenette and run electrical to keep the party going after dark. For summertime fun just add ice! Barside Pool Cabanas – Summerwood has another option for those who live entertain. The built-in bar is located on the long wall which provides so much more space for summer fun with friends and family! You can create your own design in our Custom Design Centre. Dune Pool Cabanas – Our Dune style cabana is a favorite of our professional pool and landscape clientele. The charm and splendor of its design provides a striking and contemporary poolside look. Your guests and neighbors will be asking a lot of interesting questions. 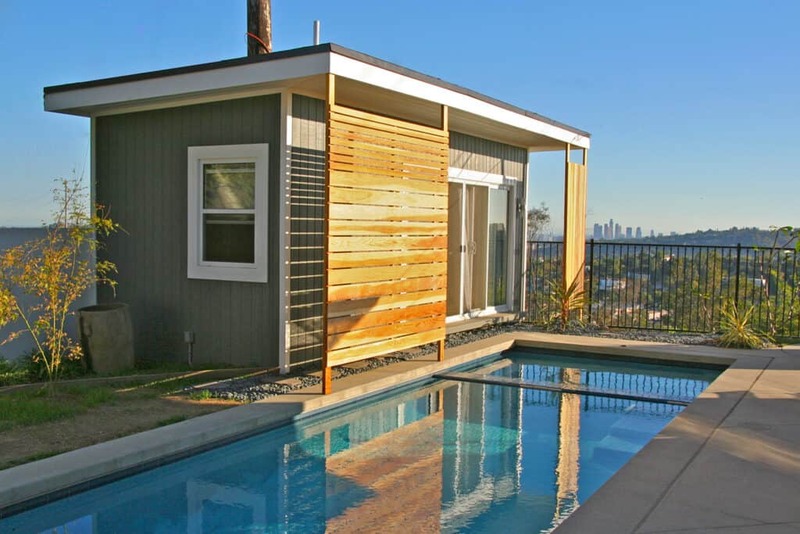 Urban Studio Pool Cabanas - Style that is sleek and simple at the same time. With its flat roof and lots of add-on options, Urban Studio makes for a perfect storage house, changing room or a cooling-off area. Catalina Pool Cabanas - Our Catalina five-sided design is a Summerwood original and a very popular choice for a pool cabana. The style nestles beautifully into any corner and makes efficient use of otherwise wasted space. Clear cedar French doors, a dormer and Sojo styled architectural windows make wonderful appointments. Sonoma Pool Cabanas – Our Sonoma style is a favorite for those of you who are looking for a multi-functional pool house. Change room, bar, storage area, it can accommodate all that and more. Dressed up with architectural windows and beautiful clear cedar doors, the Sonoma is a lovely enhancement to your poolside oasis. Verana Pool Cabanas – Our Telluride is defined by its steep roof pitch and rugged natural good looks. The design is spacious and roomy. Can come all dressed up with large doors, beautiful windows and may be dressed up with some very stylish cedar wall lattice. A bold look if the space calls for it. San Cristobal Pool House – is a classic beauty that is truly gorgeous poolside. This exquisite structure is fully enclosed and comes with French doors and beautiful opening windows (complete with screens). If natural light is a priority, the San Cristobal is a wise choice. Windsor Pool Cabanas – The Windsor is perhaps the most striking pool cabana we offer. Its’ regal look makes it a favorite for those who want to entertain in style. It’s best suited with large windows and French doors to let the sun shine in. Santa Cruz Pool Cabanas – California inspired, this pool cabana is luxurious and functional. The Dutch Hip Roof offers a ton of head room and the large windows, plenty of natural light. It’s perfect for use as a pool house and it doubles as an entertainment facility. There’s no need to run back and forth from the house. Copper Creek Pool Cabanas – This cabana has a steep roof pitch, providing just the right amount of drama to this poolside beauty. It’s elegant design performs well by the pool, it allows for the storage of pool related items in the roof and gives you enough room inside to change and house all the equipment. If you crave a wild vacation at an all-inclusive resort, yet want to remain in the comfort of your own home, you may adore the idea of using a cabana or spa enclosure to transform your pool area. With the addition of a new outbuilding, decorated with the perfect thematic elements, you can enjoy all of the best things about staying at a resort without ever leaving your home. Your themed pool and spa space will bring your friends to your poolside in droves, which has the power to increase your happiness even more. Spending your free time with friends and loved ones in such a fun and relaxing environment can even go a long way in improving your health and sense of well-being year round. Here are four awesome resort themes to consider for your home resort project. Make the most of your sunny climate with the tropical getaway theme. To bring this theme to life, you must go with the Barside or Surfside pool cabanas. These structures have a large interior space perfect for storing and preparing your favorite beverages. Around the outside, you can place barstools for your guests to perch themselves upon while enjoying their drinks. The generous overhang keeps guests resting in the shade to completely cool off before venturing back into the sunshine. Add potted palm trees, tiki-inspired decor and pineapple lanterns to complete your fun tropical theme. If you live in a relatively chilly area, on the other hand, you can surround your spa with a protective enclosure and embrace the winter wonderland theme. The Champlain, Santa Cruz, Melbourne and Coventry designs would all beautifully support this imaginative theme. Install bright white and blue LED lights in your fixtures for a health boost and to cement your fun theme in everyone’s memory banks. You can suspend gorgeous snowflakes from silver strings attached to white balloons to establish the wintery atmosphere inside the building. Set glitter-covered branches and baby’s breath in frosty blue vases around the perimeter of your spa to complete your snow-covered forest scene. No matter your local climate, or resident water feature, you can create a Zen retreat with either the Bali Tea House spa enclosure or San Cristobal pool cabana. Both of these structures feature ample windows that allow you to view the world around you while relaxing in a stress-free environment. You may reinforce the calm atmosphere found within these dwellings by surrounding them with lush green plants. Adorn your space with luxurious fabrics, scents and sounds that help replace the stress of the day with pure bliss. You can even add a massage table to your space to ensure your guests are always treated to the best resort-quality experiences at your pool or spa house. Bring your love of animals into the limelight by transforming your pool cabana or spa enclosure into a jungle sanctuary. This theme can be integrated into nearly any of the poolside structure option, though the Champlain spa enclosure captures the essence of this theme the best. You simply need to pair animal print decor and textiles with exotic plants of the rain forest. To make the biggest impression on your guests, fill a window planter box with carnivorous plants, such as Venus flytraps and sundews. You can add a garden trellis covered in climbing vines and orchids to complete your jungle resort. Kick off your home resort build with a fully customizable pool cabana or spa enclosure from Summerwood. You can visit the website to utilize the Design Center to completely personalize your outbuilding for your selected theme. You may adjust the size of the building, add unique features or simply alter the layout to suit your needs. You may also give the team a call at 1-866-519-4634 to discuss your project and receive tips and advice on choosing the perfect structure as the centerpiece for your vacation-quality resort at home. It’s that time of year again! Spring has arrived, and it’s brought along with it dreams of fabulous and stylish outdoor design. Many of us are busy spring-cleaning our homes and backyards, so that we can make the most of those beautiful sunny days and enjoy them to the fullest. Well here are Summerwood we’ve been busy making those dreams a reality for many of our customers. We’re not only concerned with fabulous and stylish design worth dreaming about, but also practicality, usability and functionality. That’s where those tricky backyard corners come in! Many of our customers struggle with finding creative solutions to maximize their backyard space and function. They want the best of both worlds: an appealing design, and a building with a practical purpose. You don’t need a lot of space to achieve it, you may just need to re-think your backyard corners! Our Catalina Corner Shed Design is the ideal solution. It’s a five-sided corner building that can be customized to transform any backyard corner from wasted to usable space. We’ll show you how it functions as a Pool Cabana, Garden Shed, and even as a Studio/Office. Turns out, you do have space for a backyard building after all! – Since it’s in a corner it can face the pool, creating a visual and functional focal point. – It’s often used as a home to hide that unsightly pool equipment. – The shape allows for lots of customization: feature a door, or hide it. – It’s great for storing all of those collected pool toys! – Can be used as a pool-side change-room, or add a bar-window to get the party started! Catalina Corner Pool Cabana: A bar window is great option for pool parties! – Customize the size of your corner shed to fit any corner. – Transforms even the smallest corners into usable storage. – The roof line is perfect for taking advantage of vertical space, lots of height! – Perfect for an oddly shaped backyard, or for those looking to maximize usable space. – Great for storing tools, garden equipment, outdoor furniture, and more! Now that’s a functional (and adorable) backyard corner shed! – Functions as an extra room for you and your family, without the hassle or expense of adding an addition to your existing home. – Use it as a backyard corner office, or backyard corner studio. – Provides separation from your work space: a functional backyard office at home, but not in your home, so you can relax! Use our five-sided corner building as your corner office, year round! A backyard corner building is great for extra hang-out space. It’s a scene straight out of any TV sitcom: after a hard day at work, a man or woman goes to their favorite watering hole to unwind with friends for a few drinks. The “local pub” concept has been an institution in society for thousands of years as a place where people come together to relax, celebrate, and socialize. But what if there was a way that you could have all of this from the comfort of your own home? Jump onto Pinterest and you’ll find a dazzling array of Pub Shed creations. This is the time to really flex your creative muscles and dream big. Have you always wanted to have the perfect hunting-themed man cave? How about a relaxing beach cabana with wicker furniture, ocean murals, and a hammock? Or even a retro-themed movie theater concession stand complete with 50s décor and vintage posters? All of these have been done before with a Pub Shed. Because it’s a smaller space, you can style your shed any way that you want to without breaking the bank. You can decorate both the outside and the inside, or leave the outside as it is and surprise your guests when they open the doors. If your shed is very small, your bar may simply have to consist of shelves on the wall or be tucked into the corner. However, if you have a little more room, you’ll probably want an actual standing bar so you don’t miss out on the Cheers experience. The bar is the centerpiece of the whole Pub Shed, so don’t skimp on the details. For a classy touch, consider a rich granite or elegant marble countertop. For a more rustic appeal, choose wood, bamboo, or a tiki-style thatched top. Glass countertops are another popular option, and you can have lighting installed underneath them for a futuristic theme. You have two options for seating in your Pub Shed: indoor and outdoor. If your Pub is standing-room only, you’ll need to provide plenty of outdoor seats. Choose ones that work with the theme of your bar, but are also in weatherproof materials so you don’t have to bring them in every night. For indoor seating, pick either comfortable benches or traditional bar stools. Retro-themes are also very popular, and they look best with the classic 50s stainless steel and vinyl stools. Regular kitchen chairs can also work just fine, and you can paint them to match the rest of the décor. The right style of lighting is essential for every Pub, but you may be limited if you don’t have electricity available in your shed. One easy solution is to simply use a heavy duty extension cord connected to your house. Alternatively, you can use a variety of electricity-free lighting solutions. Candles add instant atmosphere to a pub, and battery-operated versions are available if you’re worried about open flame. Additionally, you could use Coleman lanterns which would complement a rustic theme, or even oil lamps for an old-fashioned touch. For a groovy 70s style look, a lava lamp will provide both color and ambiance. It’s easy to convert an existing shed that’s already on your property into a pub. However, you will need to find a new place to store your lawnmower, gardening equipment, or unwanted Christmas presents. A better option is to buy an stylish new shed like the ones offered by Summerwood. At Summerwood, you’ll find a wide variety of prefabricated sheds that can work with any theme you have in mind. You can also have a shed custom-designed so that it not only meets your needs but is also unique, stylish, and completely tailored to your personal taste.